Be a part of the conversation. Become a Member. There are several categories of membership in SDOGA. The Basic membership is geared for an individual or student. The Associate membership is based on allowing educational universities, and non-profit trade associations to participate. The Sustaining membership for non-producing companies is based on a flat amount reflective of company size. Corporate membership is reflective of a flat amount for producers, transportation, processing, and refinery companies. As a member, in addition to personal contacts, letters, and telephone calls, you will be updated through a variety of bulletins, digests, and advisory material dealing with specific concerns and developments relevant to the Industry. In addition, Association members are kept advised through an electronic newsletter, SDOGA E-News, and you will have access to the members only section of this website. You will have access to member benefit programs, including the extremely successful Rocky Mountain Oil & Gas Awards Industry Summit. You will also be entitled to member rates to attend Association meetings and seminars, including the Black Hills Bakken & Investor Conference. Corporate, Non-Producer, and Associate members can participate on Committees, serving as the principal forum for public discussion on issues affecting the industry by leaders of government and business. In addition, SDOGA’s yearly agenda includes technical and issue driven meetings, networking socials and Association committee meetings. 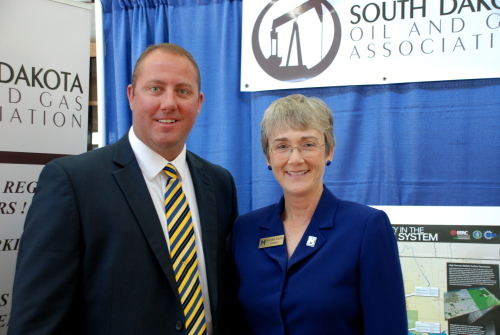 While you work hard for the industry, we’ll continue working to ensure the industry has a future in South Dakota. Those who develop, produce, transport, process and/or are a refinery of oil and/or natural gas, including producing natural gas utility companies and integrated oil companies. Includes naming unlimited company personnel as members, subscriptions to SDOGA’s newsletters and advisory bulletins, access to member benefit programs, member rates to attend Association meetings and seminars, plus automatic access to participation in SDOGA’s influential, issue-driven committees. Those who are engaged in oil and gas service-related activities offering products or services as a vendor, manufacturer, and distributor. This membership level includes but is not limited to: accountants, contractors, engineering firms, attorneys, catering companies, sales representatives, insurance firms, marketers, and allied industry companies, etc. Includes naming unlimited company personnel as members, subscriptions to SDOGA’s newsletters and advisory bulletins, access to the members section of SDOGA’s website and member benefit programs, member rates to attend Association meetings and seminars, plus participation in SDOGA’s influential, issue-driven committees. Includes any non-profit organization, state agency, or educational institution with an allied interest in the oil and gas industry. college, university, or trade/technical school. Includes the traditional benefits of membership, and institutions can also use SDOGA to connect with member companies to place graduating students. Includes subscriptions to SDOGA’s newsletters and advisory bulletins, access to the members section of SDOGA’s website and member benefit programs, member rates to attend Association meetings and seminars, plus participation in SDOGA’s influential, issue-driven committees. Basic individual memberships may not promote or represent any business-related activity at official SDOGA hosted events or to other SDOGA Members on behalf of individual membership. Includes subscriptions to SDOGA’s newsletters and advisory bulletins, access to the members section of SDOGA’s website and member benefit programs, and member rates to attend Association meetings and seminars. Student memberships are not included in the membership directory. Complete Your Participation in the Industry’s Association.